The penultimate day of pre-season testing at Barcelona saw cooler conditions that the previous days, but it proved a very busy day nonetheless, as every meter counts before the cars are flown to Melbourne. Kevin Magnussen and Stoffel Vandoorne were the first men out on track. The two were obviously eager to get some mileage under their belts, and both their teams are at the bottom of the ranking when it comes to laps completed so far in pre-season testing. Vandoorne was immediately sent out with flowviz on the car to validate some airflow expectations, whereas Magnussen seemed to do some correlation tests by running at constant speed on the pit straight. Renault's Nico Hulkenberg also emerged out on track 10 minutes later, with his R.S.18 fitted with fairly elaborate aero rakes behind the front wheels. At McLaren, they were again preferring the hyper-soft Pirelli tyres. Following a 9-lap stint by the Belgian, and a brief moment in the pits, he returned to the track with another set of hyper-softs to record a 1m18.855s to take the top spot. That's 8 tenths down on the best time from Ricciardo yesterday, albeit on the colder track. Renault had none of that however, and 40 minutes later it was Hulkenberg who topped the timesheet, shaving off another 2 tenths of Vandoorne's time. The German similarly used the hyper-soft tyres. A few minutes before 12, it was time for Vettel to strike. 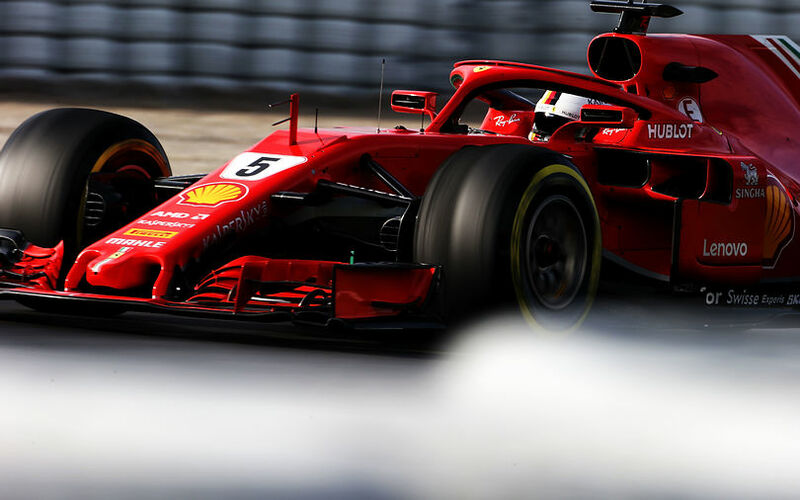 The German Ferrari driver hit hard on a set of supersofts to go fastest, marginally slower than the track record of Daniel Ricciardo yesterday. That very track record was broken still, as half an hour later, Vettel was back at it, this time on the pink hyper-soft tyres, going round Circuit de Catalunya in 1:17.644s, nearly half a second better than Wednesday's record time. And that wasn't the end of the story, as Vettel return another 20 minutes later to post two further improvements in a qualifying simulation. This sharpened the track record to 1:17.182s. At the same time, Kevin Magnussen in the Haas was on a similar run, but stranded at 1.2s of the scarlet Ferrari. After lunch, most teams went on with race simulations and somewhat less of a focus on qualifying runs. There were also driver changes, with Hamilton taking over again from Valtteri Bottas. Robert Kubica took over from Lance Stroll while Sainz drove the Renault R.S.18 in the afternoon. It was the start of a very productive afternoon, with literally every team ending the day with more than 100 laps completed. Part of that was due to there being few interruptions. In fact, the only red flag of the afternoon was caused by Marcus Ericsson who beached his Sauber at 16:50 local time. At the end of the day, Vettel's impressive time remained unbeaten.